During the course of our conversation in his Senate office, McCain spoke about decades-old skirmishes with real intensity, as if they were still fresh in his mind. We met on the day that Al Qaeda claimed credit for freeing possibly as many as 500 inmates from Abu Ghraib prison in Iraq, and as we sat down to talk, McCain was waving around a printout of a news article about the breakout. Isaac Chotiner: I hurt it playing basketball. JM: Well, you gotta be careful. This thing that happened, in Abu Ghraib, where they freed all these terrorists. Most of those guys will end up in Syria. IC: Is the Syrian war making the situation in Iraq worse? JM: Oh yeah. But the fundamental mistake was when we did not keep a residual force behind in Iraq. The president basically campaigned saying that he’d get us out of Iraq, and I am very respectful of that position, but all along we knew that we had to leave a residual force behind for a number of missions. IC: Do you see a situation where we would send troops back to Iraq? JM: I don’t see how you do that. I just don’t. I think it’s too late. The whole tragedy of this is four thousand brave Americans [died], and I don’t know how many thousands lost limbs, and it’s all for nothing. And we had it won. JM: I respect his position, but I heartily disagree with it. He was fulfilling his campaign promise—I don’t know how we got off on this. IC: You were reading the article. IC: We can go back to my basketball injuries. Hillary Clinton has "maybe not glamour, but certainly the aura of someone widely regarded throughout the world," says McCain. IC: You have called for a cut in military aid to Egypt. JM: Here’s the conundrum: A law was written—whether it was a good law or a bad law—that specifically states a coup would require a cutoff or suspension of aid. Now, I am asking the Egyptians to abide by the law, and I am asking them to set up a constitution and a freely elected government, and the first thing I would do is say, Never mind our law? But our statement laid out very clearly that aid can be restored with a constitution, a free election, and inclusion of the Muslim Brotherhood. It was a tough call. So, I have had a relationship with their military for years. I met this guy [the new leader Abdel Fattah] el-Sisi, and as soon as I met him, I said, This guy is not his predecessor. And everyone said, Oh no, he’s [Mohamed] Morsi’s guy, and I said, Not this guy, he’s his own guy. IC: Morsi may have thought he was Morsi’s guy. JM: I was just about to say that. Created a monster [laughs]. IC: How do you think your old friends Chuck Hagel and John Kerry are doing? JM: I hear good reports from friends in the military that Hagel is respectful. I think he is doing OK. And John Kerry I think is working extremely hard, frenetic. I met with him yesterday morning. But I am a little worried about whether John is trying to take on too many issues at once, and I think that is a shared concern amongst many of his friends. And I have expressed that to him. But I don’t think there is any doubt that, if you look at the world five years ago and today, we live in a far, far more dangerous world. There is a lack of American leadership. I hear that every place I go in the Middle East. This massacre in Syria is one of the most shameful chapters in American history. I have not been more worried about the world as we see it—ever. This is the greatest seismic event in the Middle East since the fall of the Ottoman Empire. And we are bystanders. IC: Given that you think things are out of control, what do you make of Hillary Clinton’s term as secretary of state? JM: I think she did a fine job. She’s a rock star. She has, maybe not glamour, but certainly the aura of someone widely regarded throughout the world. I do think it is interesting that the issues where John Kerry is engaging is where Hillary Clinton did not engage in, that those decisions were left to the White House and the National Security Council. JM: Can we just talk a little about what happened at the hearing [on Syria]?2 Dempsey was asked a question by Carl Levin, which we ask of all nominees, “If asked for your personal views by this committee, will you give your personal views even if they are contradictory to administration policy?” No sooner does he say that than I asked if Syria was better or worse off by the fact that the U.S. has not been involved. He said he wouldn’t answer. He would talk to the president, blah-blah-blah. He had just said he’d give his personal view! It got really testy. And he didn’t answer. I went to see Carl Levin, and asked if we could send a letter with these questions. And we got the answers yesterday. In all the years I have been associated with the military, I have never read anything as bizarre as those answers. Basically, Dempsey said we would have to declare World War III in order to help the Syrians. One phrase was “hundreds and hundreds of planes and tanks and thousands of troops.” This affirms everything bad I have seen about military leadership in my time. It’s the worst I have ever seen. IC: Don’t you think Iraq has colored the discussion about all these things? JM: I know it has. I know it has. But I am also totally convinced that the option of doing nothing is the worst option. And I am also convinced that, unless we do something that changes the equation, the situation, there will be a stalemate. IC: I want to talk about the Senate. It seems to me that the GOP leadership has been frozen by Rand Paul and Ted Cruz. JM: I am not sure if it has been frozen, but certainly there is an element in the party that has been there prior to [World War II], the isolationist, America-Firsters. Prior to World War I, it was Western senators, and then Henry Ford and Charles Lindbergh, and then Taft versus Eisenhower. Even Reagan—Reagan’s presidency was perfect without ever a problem [said sarcastically]—there was an isolationist wing that fought against Reagan. And now the bad economy has exacerbated what has always been out there. IC: Do you think this wing has changed the comity in the Senate? There were the attacks on Hagel. Do these things concern you? JM: Oh yeah. It’s of concern. But it’s important for me to be respectful. After I called them wacko birds, I apologized. I try and be respectful but also go out there and debate them every chance I get. Small example: For four years, Harry Reid—and I beat him up regularly—wouldn’t bring a budget to the Senate. This year, we brought one, stayed up all night. We were so proud, we passed a budget resolution—most of it nonsense—but guess what? Now we have the same group3 who are blocking going to conference. The same group sometimes doesn’t want to take up a bill and at other times blocks a bill because they can’t get all the amendments they want. IC: The GOP leadership—Mitch McConnell, Minority Whip John Cornyn—is from the same states as Cruz and Paul. Is that a particular problem? JM: Let me just clarify that. I think that Rand Paul represents a segment of the GOP, just like his father. And I think he is trying to expand that, intelligently, to make it larger. IC: Were you surprised that the GOP allowed sequestration? JM: I think the way it was sold, that the Sword of Damocles would never fall, was a contradiction. You should never point a gun unless you were going to pull the trigger. The leadership said this would never happen. It is the worst vote I have cast in many years. IC: Do you think Obama has grown in office since 2009? JM: Oh yeah. No doubt. JM: He had just won a huge victory in 2009, had overwhelming majorities, he could pass whatever he wanted. That breeds a certain degree of confidence, if not—the word isn’t cocky, it isn’t arrogant—a certain self-assuredness that you don’t have to deal with the minority. I think the big mistake was doing Obamacare when he should have addressed the debt. He had the votes to do it then. That is for historians to decide. He was confident and had reason to be. Here is a young man who, six or seven years before, was a state legislator and had lost a primary for a House seat. I think he has grown to appreciate bipartisanship. He is looking at his legacy. I know that for a fact and it is entirely appropriate. One is, close Guantánamo. It is an unfulfilled commitment. Outreach to me and Lindsey. So yeah, I think he has learned a lot. JM: I expressed a little frustration. But Marco Rubio has played a tremendously important role, he is very articulate, and he has been going out there on the talk shows. He has a bright future in the party. He is a valuable candidate for president. Some people say this will set him back, but remember, I got the nomination of the party after failing on immigration in 2007. Yes, he is new to the Senate, and yes, sometimes I would have liked for Marco to say, Hey John, I am going to say X, but that is minor stuff. IC: So you don’t put him in the Mike Lee/Rand Paul/Ted Cruz category? JM: Oh no. I do not. Not in any way. IC: You have had conversations with people at Fox, The New Yorker reported, about immigration. There is a real divide in the party. What do Roger Ailes and Rupert Murdoch say about whether the party can come along on this issue? JM: It is well known that Rupert Murdoch is a strong supporter of immigration reform. Roger Ailes is also a realist. He believes that immigration reform is vital to the country first, but also the GOP. Yet he does not dictate. [Sean] Hannity has come out against it and kept his job. I don’t think Roger Ailes is ham-fisted. IC: But if you watch Fox, there are all these segments on immigrants and crime and so on, and people get riled up, and then they want reform. It’s a difficult dynamic in the party. IC: They have to cross the border to do that? IC: I am sure you hate psychological questions, but people say you are driven by anger: that you were angry about Bush, so you worked with Democrats; and then you were angry with Obama, and so you swung right. And now there’s Ted Cruz and the rest, and you are working with Democrats again. JM: If you use the word anger, then obviously it is a very detrimental trait. If you use the word passion, that is a valuable thing to have. Losing to George W. Bush didn’t change my behavior. I thought as a fiscal conservative it was wrong to have tax cuts that we didn’t pay for, to have a secretary of defense who was the steward of a failing strategy in Iraq. And so it wasn’t anger, but when I go to Walter Reed and see men with no legs, and have my own sons serving in the military, I feel passionate. If I didn’t feel passionate, I shouldn’t be in the business I am in. Have I stepped on some toes? Yes. Have I angered some people that I probably could have avoided? I think so. But I would challenge you to talk—with rare exceptions—to my colleagues, and they would say I treat them with respect. It’s maybe interesting that, whenever there is a major issue to be addressed, somehow I am in the mix. You don’t get in the mix unless you have the respect of your colleagues. Maybe you can name me a major issue that has come up that I haven’t been in the mix about. JM: And that’s what I’m here for. JM: Wait—I was never angry and bitter at George W. Bush. We reconciled and I campaigned for him. That’s just simply false. Now, you could argue about Obama—“the angry old man”—but the fact is, the first issue that came up in 2009 was Obamacare, and yes, I fought ferociously to stop it, but I am not embarrassed about it. I am proud of it, because I think it’s obvious Obamacare is becoming a failure. IC: So are you saying you were more upset after 2008 than 2000? JM: No. Look, the speech I gave on election night, I meant it.5 I wouldn’t have given it if I didn’t mean it. He won fair and square, and it was my job to work with him. In 2009, I was invited over to the White House, and I was maybe the only Republican there. They said they would get in touch with me [about immigration reform]. I never heard another word. Later, Obama had me over to the White House and said, “There’s [then–Chief of Staff] Bill Daley. We are gonna work with Senator McCain, blah-blah-blah.” I even called Bill Daley up, but never a word. Now, that has changed dramatically in the last six or eight months between me and the president. JM: On DADT, I asked for a study to assess the impact on military readiness. The commandant of the Marine Corps said he didn’t know the effects and he was opposed. So I said, “Let’s do a study.” My opposition was based on the fact that I wanted to know about readiness. IC: OK, but has our readiness suffered over the past couple years? JM: I think it has worked out. There are a number of issues that remain unresolved—who’s eligible for base housing, do we require the same physical standards to be a Navy SEAL for women as men? And obviously with this issue of sexual assaults, there are still some lingering issues, to say the least. Because a good portion of these aren’t necessarily men on women. IC: Your wife said she hopes you change your position on gay marriage. JM: Not to mention my daughter. IC: When Justice [Anthony] Kennedy’s decision striking down the Defense of Marriage Act and allowing gay marriage in California was announced, what was your emotional reaction? JM: I think it is our society evolving. It would be foolish not to observe that. But I think I am still entitled to my opinions and views and ideas. JM: It’s not a position. It’s a fundamental belief. IC: OK, your belief. But it seems like you are almost taking pride that our society is evolving. JM: I just think it’s an obvious fact. It is neither pride nor condemning. IC: What do you think your legacy is right now? JM: One of them, McCain-Feingold,6 has obviously failed, because the Supreme Court, in its omniscience, has overturned it. IC: How worried are you about the current campaign-funding environment? JM: Oh, very. Just as we predicted. I can assure you, one hundred percent, that there will be scandals. IC: This has been a long cause of friction between you and Mitch McConnell, I suppose. Something you will never see eye to eye on. JM: No. We have agreed to disagree. IC: So you aren’t going to go campaign for his opponent in Kentucky? IC: I was quoting other people. JM: OK, but when I see this London Whale thing,7 I get angry. People’s deposits are being used to waste six billion dollars. Maybe it’s the populist in me. I find these things—the word isn’t anger. It’s a sense that I need to do what I can. IC: So it seems like you are saying you are happy, or lucky. JM: Am I happy? I’d like to be president of the United States. JM: That’s right. I’m happy in what I have been able to accomplish, but it’s not so much happy as fortunate. I was on an aircraft carrier that [one hundred thirty-four] soldiers died on. I am not angry or bitter. I am very happy. IC: Does it bother you when people say choosing Sarah Palin is your legacy? JM: No, because I think historians will decide that facts are stubborn things. We were four points down when I chose her and three points up afterwards. She held her own and, some people said, won a debate with the vice president. She did everything I ever wanted. She excited our base in a way I was unable to achieve. And then I watched the shredding and destruction to destroy a good and decent person by the liberal media, beginning with Katie Couric. Not only do I not regret it, but I have probably not seen anyone in American life savaged like she was, particularly by the liberal left. IC: Do you draw any connection between her outlook and the group of congressional Republicans, Tea Partiers, that you have had trouble with? JM: No, because I think she had a positive message. A message that we would have less government, lower taxes, less regulation. Many in this group didn’t come to power to get things done. They came to power to keep things from getting done. IC: But she also accused Obama of “palling around with terrorists.” It wasn’t entirely positive. 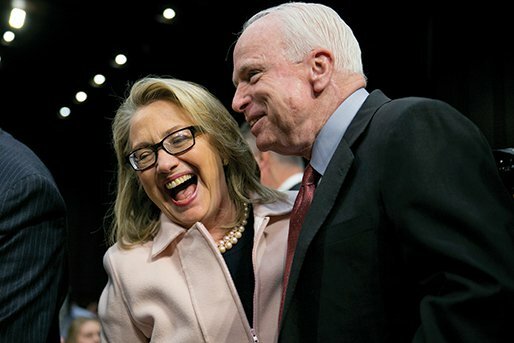 JM: Well, if she attacked Obama and Biden, that is fairly standard. IC: “Palling around with terrorists”? JM: With all due respect, you never heard about when John Lewis said my campaign was worse than the Birmingham church bombing?9 That may have escaped your attention. IC: It did. I agree, that is bad. JM: OK, well, that is what he did, when they orchestrated this “racism” effort against me. Maybe Sarah Palin said “palling around with terrorists,” but the things that were said about me and her were far worse. I’ll never forgive John Lewis. IC: Did you ever talk to Lewis? JM: No. I would be glad to show you the press release. But we selectively take something Palin said, and the vice president’s job is to attack, and how many people know about John Lewis? I can show you many other comments. For me to complain about it is a waste of time. IC: Who do you think is the best senator today? JM: I loved Bob Dole. He was so good to me when I came to the Senate. On Bosnia, he took the right side of the debate even though it hurt him with the right wing of our party, and he gave a speech on intervention in Bosnia. He happened to mention my support and said, “I wore a bracelet with Senator McCain’s name on it during the entire Vietnam war.” He never told me that. I went over and asked, and he said, “Yeah, yeah.” I thought the world of him. IC: What about current senators? JM: Lindsey Graham is like a son to me. IC: Is he that young? JM: In his fifties. Kelly Ayotte, I am very close to. Chuck Schumer. Carl Levin and I are as close as two people can be. But I also understand how transient this is. Once you are gone, you’re gone. I was wearing a cast. On July 18, Chairman of the Joint Chiefs of Staff Martin Dempsey appeared before the Senate Armed Services Committee, which is chaired by Carl Levin. McCain is referring to a group of Senate Tea Partiers, including Paul and Cruz. The Senate passed an immigration bill with a bipartisan majority, but prospects are slim in the House. The 2002 bipartisan law that imposed tougher restrictions on campaign financing. The nickname for disgraced JP Morgan trader Bruno Iksil. He has an amusingly stilted cameo. McCain’s comment is not precisely accurate. Lewis, the House Democrat and civil rights leader, issued a press release saying he was “deeply disturbed by the negative tone of the McCain-Palin campaign” and that “Sen. McCain and Palin are sowing the seeds of hatred and division.” It went on to say that George Wallace, “another presidential candidate,” helped create a climate in which four girls were killed in a church bombing.